From our investigation, it appears that the scaffolding was owned by a contractor or sub (possibly a roofer), and the scaffolding fell off his truck sometime prior to 7 a.m. on Saturday morning, January 15. It’s bad enough that this guy failed to properly tie down his equipment, but he never even stopped or notified anyone–leaving this “death trap” just sitting in the road for someone to hit. Unfortunately, our client paid the price of this person’s recklessness. 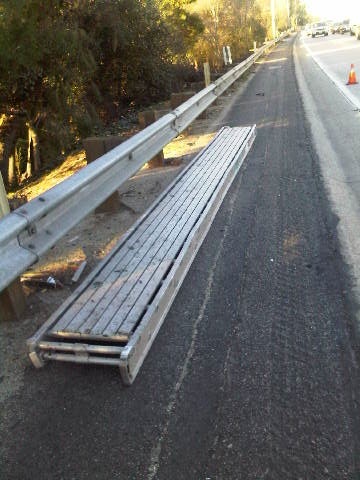 His truck was travelling East on I-134 near Pass Avenue in Burbank last Saturday, January 15, between 5 a.m. and 7 a.m. If you or someone you know has information regarding this hit and run driver, please call or email us ASAP. Without your help, this motorcycle rider and his family will drown in massive medical bills because of someone else’s recklessness. Please help. We guarantee anonymity.